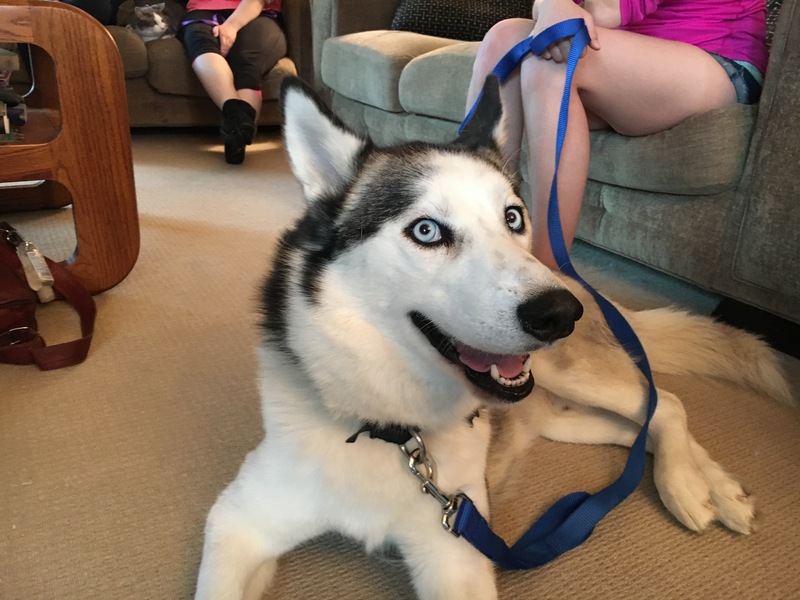 Apollo is a three-year-old Husky who was adopted a few months ago in Omaha. His guardian set up a dog behavior training session with me to get him to stop chasing the cat, stop chewing, stop pulling on the leash, stop running away, help with Separation Anxiety and help stop a fear of the kennel. Because Apollo had run out the door when a previous guest arrived, we call this door dashing, his guardian had him on the leash. He was clearly excited; doing some pulling towards the door and jumping up. Later in the session I showed his guardian how to teach him a new door behavior. Staying behind an invisible boundary 10 or so feet away can help decrease his excitement while also giving the humans more time to react if he tries to make a break for it. Part of the instruction was how to break answering the door into small individual steps. This gives you the opportunity to help the dog practice each step individually; a much easier way to train a dog. You keep repeating each step and stop when the dog gets out of position. This allows us to avoid correcting the dog. Instead we redirect them back into the position we want, then richly reward them for doing so. After a while the dog gladly does the behavior you want to get the reward. This is a great example of why I only use positive dog training. I was planning on doing some counterconditioning to help Apollo learn to be in the same room without fixating on or hunting the cat. But when we brought the cat out and I gave him a Bully Stick, he was completely content with it; showing little to no interest in the kitty. This leads me to believe that while there may be some prey drive impactors, this is more a case of the dog not respecting the authority of his guardian. I shared a number of tips to add structure, new ways of communicating, a few techniques to redirect him as well as non verbal ways to disagree. Its going to be important that the guardian consistently reward or correct him within 3 seconds to help him better understand what is and is not allowed. She will also need to consistently enforce the new rules, pause and wait for him to settle down when he gets excited and practice crate games to help him develop a positive association with the kennel.